« Confidence + Focus = Action! steps in decision making are below. It is common for people to get caught in a “feedback loop” in step 3, to keep circling back between steps 2 and 3, and never making it to step 4. Another scenario is to make the decision and then become caught in a fear trap- procrastinating and not taking action. If you need help with these or similar issues, an advocate and brainstorm buddy,you may contact me for a Complimentary Peak Performance Success Coaching Consult to set up a personalized program to figure the “its” out and you will take action. Our sessions may be in Baldwin, Long Island and effectively via phone or Skype. To arrange, please contact eileen@balanceandpower.com 516 623 4353. Organizational and corporate teams may experience similar issues as individuals, on a larger scale. Make your last quarter SOAR! 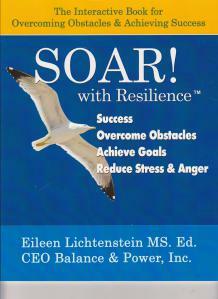 with Resilience™ to experience optimal levels of success, happiness and productivity with a Balance & Power “SOAR! with Resilience(r)” Training, Coaching and Motivational Keynote for your team and company.